UK newspaper ordered to pay MP £30,000 in damages after they claimed a band he recorded with “delights in Nazi symbols"
Labour frontbench MP Richard Burgon has won £30,000 damages against The Sun newspaper, who claimed a band he had recorded with used Nazi imagery. Burgon subsequently brought a libel case against The Sun, and at the High Court in London, Mr Justice Dingemans ruled in the politician’s favour. Responding to the ruling, Burgon said: “Delighted to have won my High Court case against The Sun. Their slur attempting to link me to ’Nazi symbols’ was held to be false and defamatory. The BBC also report that The Sun said they were “deeply disappointed” by the ruling and will appeal the judgement. They said in a statement: "We fundamentally disagree with the judge's conclusions and, furthermore, fear they may act as a brake on the ability of the free press to hold those in power to account and to scrutinise the judgment of those who aspire to the highest offices in the land." 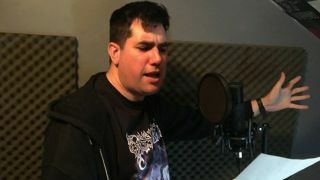 Speaking exclusively with Metal Hammer in 2016, Burgon spoke about his love of metal and revealed he was eight years old when he discovered Iron Maiden.